I decided to treat my family for a delicious lunch in Burgoo which is one of our favorite restaurants in Fairview Terraces. 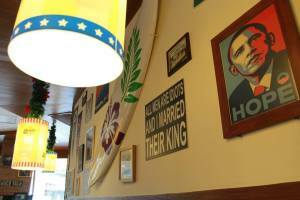 They serve American style cuisine from pastas, pizzas, burgers, steaks, ribs to seafood. We decided to take a bite of our favorite Meatza (All-Meat Pizza) and Seafood Au Gratin Pasta. My kids will never be left out because I ordered their favorite Supreme Sampler (buffalo wings, cheddar cheese fries, mozzarella sticks and onions rings). 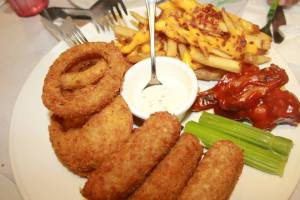 Supreme Sampler- Php425.00 - A combination of buffalo wings, cheddar cheese fries, mozzarella sticks and onions rings. 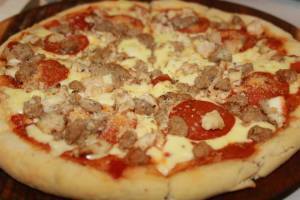 Grilled chicken, pepperoni, italian sausage topped with oven-baked tomatoes. 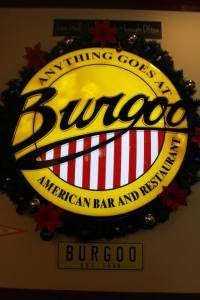 Everyone loves Pizza and Burgoo Meatza will never disappoint your craving for a delicious All-Meat Pizza. A combination of fresh shrimps calamari mussels and clams in half shell, cooked in pink sauce and Bucatini pasta, gratinated with mozzarella and Parmesan cheeses. 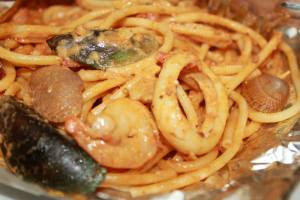 I’m not a fan of Seafood but I really enjoyed eating this pasta. The rich, thick, pink sauce made this pasta a special treat for the whole family to enjoy.